Last week brought the type of fall weather that is so gorgeous that it makes me sound like Goldilocks: September is too hot, and November is too cold, but these sunny, cool October days are juuust right. Made for snuggling up in a sweatshirt in the evening. Ideal for jogging outside in long pants and a short-sleeve shirt. 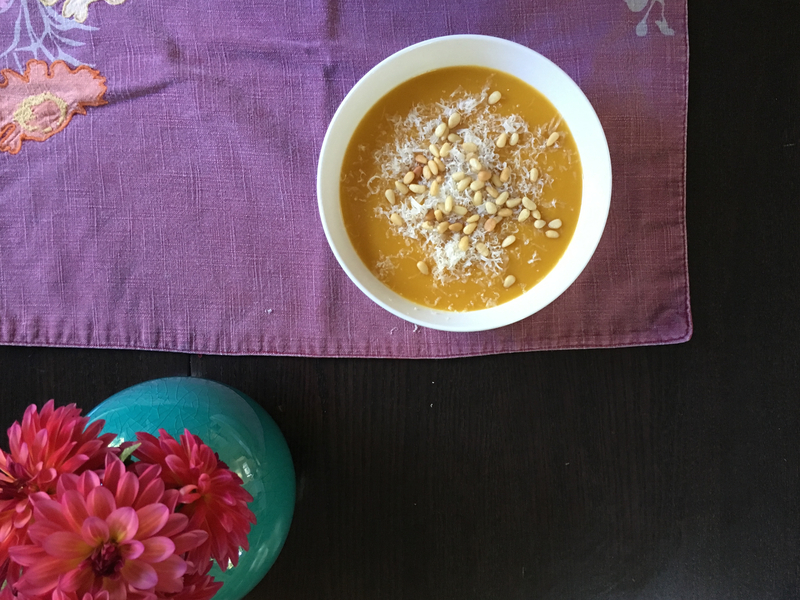 And, of course, perfect for getting excited about enjoying my favorite fall foods (/drinks): soup, butternut squash, and red wine. I ended up with a butternut squash in vegetable garden sort of by accident. I had saved some kabocha squash seeds and planted them, but the first couple of seedlings got destroyed by a strong storm and a puppy running through the garden. I figured I’d just have to wait until next year to try hard squash, but then I noticed that the compost bin was sprouting all sorts of veggies. I tried planting some of the sprouts that looked like squash, hoping one would be a kabocha, and instead I got a very healthy butternut. I swear I did not fertilize this thing more than once or twice; I’ve grown butternut before, and they did not turn out this gargantuan. The first one I picked was pushing 8 pounds and made me seriously consider entering a county fair for the first time ever. Feeling apprehensive about the thought of ever going through childbirth. So, feeling thankful that butternut freezes well, I set about making a soup with at least part of this enormous squash. 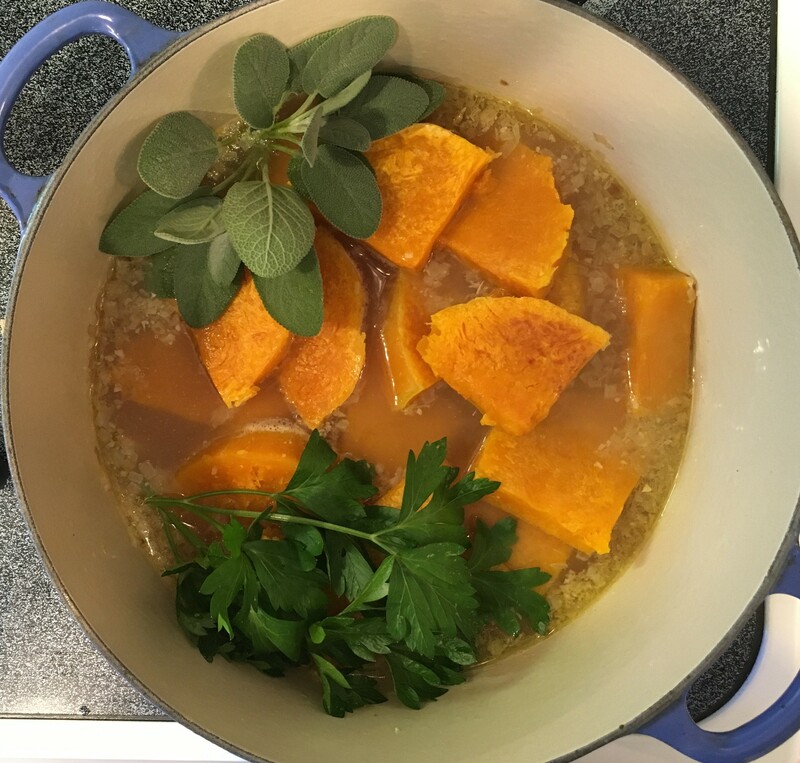 I love the classic butternut-sage combo, so I used some fresh sage (and parsley) from the garden. Since I wanted the finished soup to be super smooth and not have little pieces of herbs floating in it, instead of chopping up the sage and parsley, I tossed the sprigs in whole while the soup simmered and removed them later. Instead of peeling the raw butternut, I first roasted it unpeeled and then removed the peel, for two reasons. First of all, any hard squash can be a pain to peel when it’s raw, but it’s a piece of cake once it’s cooked. But besides that, handling butternut gives me that awful skin reaction pretty badly, and minimal touching of the raw squash helps avoid it. I wanted the soup to have a least a little protein and heft without adding milk or cream, so I used a can of cannellini beans, liquid and all. They are super soft and creamy and blend up beautifully without adding a strong bean flavor to the soup. For serving, some Parmesan gets grated on top because grated Parmesan makes almost any soup better, right? 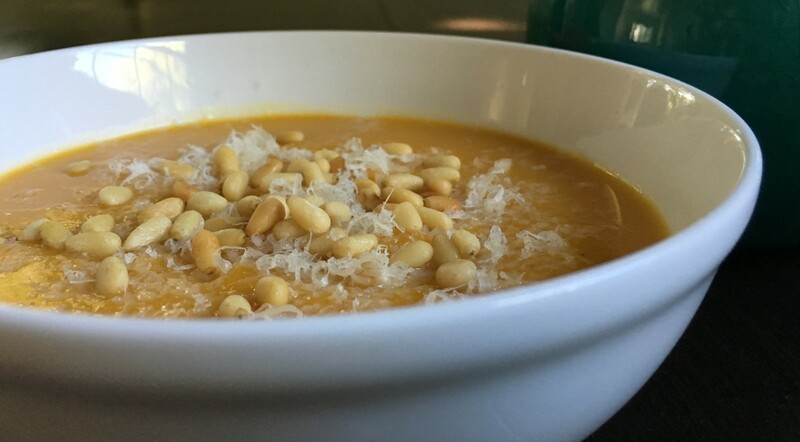 Also, although I did want the soup itself to be as smooth as possible, it’s nice to have a little crunch too, and a handful of roasted pine nuts does the job nicely. Note: The soup could turn out thicker or thinner if the ratio of squash to broth is changed. I used a scale and weighed my squash, but that was 3 pounds of pure, solid squash flesh, no seeds at all. Preheat the oven to 425º. 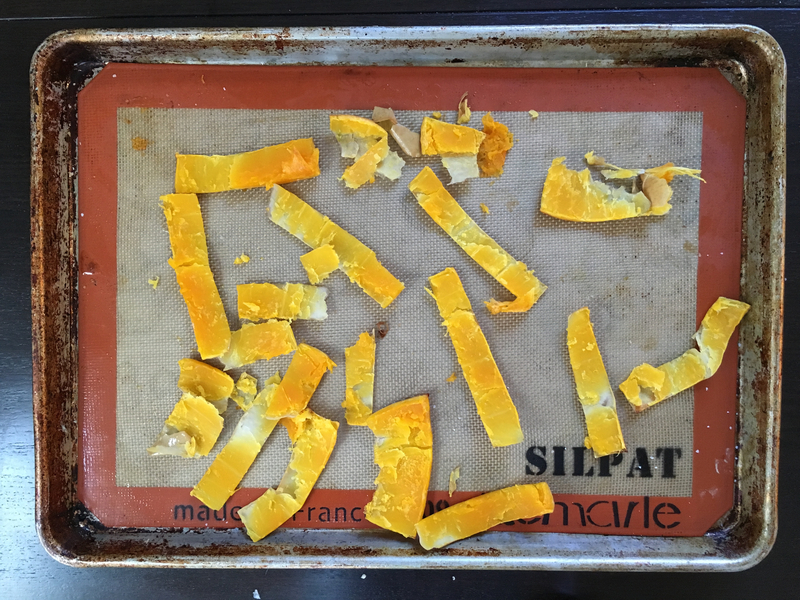 Cut the butternut into medium-sized (3″) chunks. No need to peel it. Place the chunks on a Silpat- or parchment-lined baking sheet, brush with the melted butter, and sprinkle with 1/2 tsp. of the kosher salt. Bake until tender, about 30 minutes. It’s ok if the squash is not not 100% cooked because it’s going to simmer in the soup for a while. When the squash is cool enough to handle, use a paring knife to remove the peel from the chunks. Heat the oil in a soup pot over medium to medium-low heat. When the oil is warm, add the shallot and the remaining 1/4 tsp. kosher salt, and sauté until golden brown, about 4 minutes. Add the garlic. Stir constantly until fragrant, about 1 minute. Add the beans (with the bean water—no need to rinse and drain), the chicken stock, the peeled butternut chunks, the parsley, and the sage. Turn the heat up and bring to a boil, then reduce heat and simmer for 20 minutes. Take the pot off the heat. Remove the sage and parsley sprigs. Add the nutmeg and brown sugar, and let cool for a little while. Taste the soup. 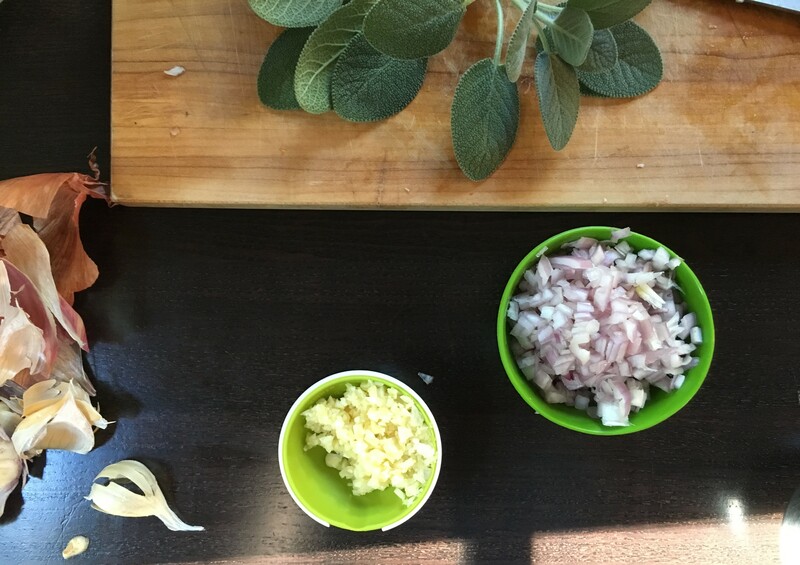 Season with white pepper and add more salt to taste. Just before serving, top each bowl of soup with about 2 Tbsp. of the Parmesan and a small handful of the toasted pine nuts.